I found these interesting charts on Environment Canada's website with a breakdown of GHG emission sources by province and by sector nationally. 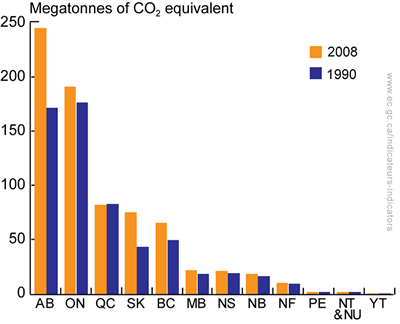 Not surprising but Alberta is responsible for a full 33.4% of Canada’s total GHG emissions. That means per capita Alberta produces 84 tons of GHG emissions which is the same as Saskatchewan. This compares to the per capita GHG emissions of Ontario and BC which are 17 tons each while in Quebec it is 12 tons. It's no surprising that in our current political environment, nothing will be done to combat climate change. In the ideal world, the federal government would work with the prairie provinces to help them move away from fossil fuels for electrical generation, thought the elephant in the closest is how to provide good paying jobs in Alberta while moving them away from the deadly oil and gas sector.